Karajan’s visit to London with the Vienna Philharmonic in 1962 was evidently a significant occasion. The newspaper reviews, as quoted by Richard Osborne in his liner essay, were effusive, suggesting that, even by this date, British critics were not yet fully aware of Karajan’s interpretive skills. He had been Director of the Vienna State Opera since 1957, making him the de facto Music Director of the Vienna Philharmonic too. He’d also been Principal Conductor of the Berlin Philharmonic since 1954, but, as Osborne writes, he treated the two ensembles very differently. While he was keen to impose his interpretive views on the Berlin orchestra, he treated the Vienna Philharmonic more reverently, seeking dialogue with their interpretive traditions in the core repertoire. Even so, what we get here is classic Karajan, masterly readings of both symphonies, each with the conductor’s trademark combination of grandeur and grace. The recordings were made by the BBC. But before anybody gets excited about the Corporation finally opening up its archives to commercial record labels, that’s not what’s happened. The source for the tapes is the Music Preserved charity, who in turn sourced them from the Borthwick Institute at the University of York. The BBC’s logo appears on each of the discs though, suggesting they have at least endorsed the project. The sound quality is reasonable given the age. The mono sound is clear, but the almost complete absence of tape noise suggests some quite intrusive processing at the remastering stage. There are one or two clicks in the sound here and there, presumably tape damage, but they have been reduced virtually to silence. The sound of the orchestra is clear but not particularly involving. The first disc opens with recordings of the British and Austrian national anthems from the start of the concert. I’ve no idea who these are intended to benefit; the musical interest they offer is limited to say the least. Some of the advertising literature for this release states that the concert appears here complete, so perhaps their presence is intended to enhance that impression. In fact, the encore is missing, a performance of the Meistersinger Overture, which would have been much more welcome. Unfortunately, though, the BBC technicians had turned their machines off by then and returned their listeners to Broadcasting House. Osborne draws parallels between Karajan’s “Jupiter” and Strauss’s. Apparently Strauss’s performances of the Symphony were the model that Karajan aspired to. Certainly, the combination of elegance and propulsion that we find in Struass’s version is present here, but in general, Karajan’s version is much slower, or at least seems so. To modern ears, the whole Symphony feels very under tempo, although, this being Karajan, the music always flows and the tempo choices always seem logical. The finale, in particular moves at what feels like a glacial pace, a stark contrast to Strauss’s nimble and highly-charged version. In fact, the Karajan is almost exactly the same duration (5:45 to Strauss’s 5:37 in 1926), but everything about it is weightier; Strauss sounds positively frivolous by comparison. The Bruckner is a similar case: fast by Karajan’s standards but slow by today’s. Osborne informs us that, at 63:07, the performance is faster than any of Karajan’s commercial recordings. It doesn’t feel it though. All the majesty and splendor of his studio versions are present. Perhaps the slightly faster tempos allow him to increase the drama in the outer movement climaxes, but he was more than capable of doing that through his manipulation and maintenance of the orchestra’s tone. That’s where this recording of the Bruckner fall down, sadly. 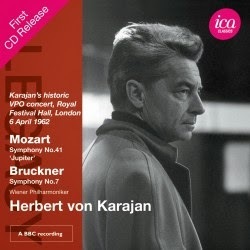 The thinness of the orchestral sound, especially the strings, compromises Karajan’s reading throughout. If that is a result of over-zealous restoration, then it is a great shame, although it may just as likely have originated from the original tapes. Some of the playing is a bit scrappy too, at least by this orchestra’s standards. The woodwind occasionally struggle with their ensemble and often lack unity of intent. An interesting historical release then, but hardly an essential one. It proves, if any proof were needed, that Karajan could conjure as much magic in the concert hall as he could in the recording studio. The faster tempos in the Bruckner may separate this reading from his commercial releases, but they make very little difference to the listening experience. A worthy supplement to Karajan’s impressive discography of both composer’s music, but separated from his studio versions only by the smallest of interpretive details.